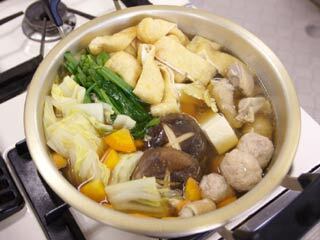 Chanko-Nabe is one of the common Nabe, the Japanese style stew. Chanko is an official food for Sumo Wrestlers. So, originally Chanko-Nabe is the Nabe made by and for Sumo Wrestlers. Because pork and beef are quadrupedal and they are always hands on the ground, which means to lose in Sumo, Chanko uses only Chicken. There is no definition of the ingredients, but Chanko-Nabe is always filled with many foods. - Soy Sauce, Sake, Mirin and Salt. Let's remove extra oil from Aburaage by pouring hot water. Cut Aburaage by 1cm wide. Take out the outside leaf, the cut it 5cm wide. Cut Garlic Chive 5 cm wide. Cut top and bottom, then peel off. Then slice them about 1 cm thick. Cut the root, and slit top cross. Cut Chicken into one bite size. We use Kelp and dry bonito for Dashi. This is Dry Kelp for Dasih. When you use Kelp for Dashi. Remove all dusts on Kelp, but never wash it with water. Put kelp into water (600ml). Kelp makes more soup if leave them for about 30 min. Once it's boiled, then stop the heat and remove kelp. Then add Dashi (600ml) from Dry Bonito. Kelp Dashi and Bonito Dashi are the same amount. Add Salt, 4 scoops of small table spoons. Add Sake, 4 scoops of large table spoons. Add Mirin, 4 scoops of large table spoons. Add Soy Sauce, 4 scoops of large table spoons. Let check out its taste. Never let it boil so hot. Use small fire and boil them until chicken is cooked.